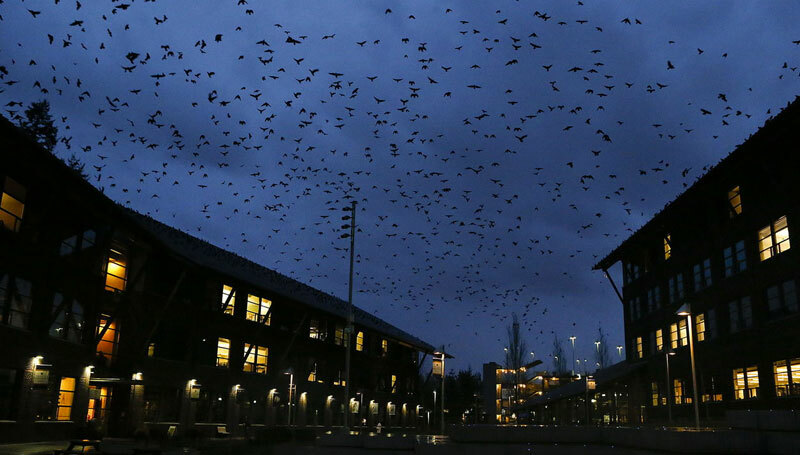 A mysterious gathering of thousands of crows takes place at the UW/Cascadia Campus in Bothell during fall/winter every year, and it is a stunning sight to see. Just as dusk begins to its cast long shadows over the campus grounds and the sky is stained with the orange light of a fading sun, clouds of crows come swarming overhead like a shroud of darkness, creating a dystopian scene of menace and awe-inspiring beauty that is more surreal than any make-believe Halloween decoration you can ever buy at Party City. This year, Bothell Parks & Recreation is hosting its first ever `Crow Watch’ on October 27th, from 3 pm-6:30 pm, so people can come and enjoy a full-blown experience of this incredible, natural spectacle, three days prior to Halloween. Besides the Crow Watch itself, there will be interactive displays, presentations from UW/Cascadia professors, native storytelling, and so much more to fill you with the sensation that Halloween is definitely in the air. As a member of our thriving Bothell community, Beardslee Public House is supporting the Crow Watch with a special offer for guests who have tickets to the event. Show us your ticket from the event and enjoy a pint of our Black Crow Licorice Stout on the night of the Crow Watch for just $2!